Me and my hubby enjoyed so much in our one day Guimaras tour, with Flor, Vic and Mat-mat. The minute the boat moved swiftly away from the island, I can’t help not to look back and be thankful that we explored another beautiful place. I can’t to wait to explore more of Iloilo. My excitement in my second day in the city was still soaring high. While walking away from the wharf along Ortiz Street, Flor halted her steps when we were in front of a well-preserved and beautiful mansion. She told us it was owned by the Ledesmas. The structure’s design and color were compelling. The white eagles on every posts looked like guards protecting the entire house. 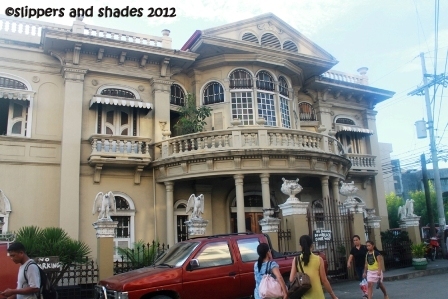 There were other mansions in the province owned by the Lopezes, Jalandonis, Coseteng and Montinolas. It’s good that we unexpectedly saw one. 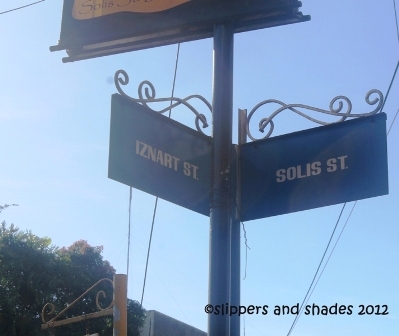 At night, we explored Valeria, Delgado and Solis streets in search of a restaurant or bar to eat. Suddenly I craved for Iloilo’s famous Batchoy so my hubby brought me to Ted’s Oldtimer Lapaz Batchoy near SM Delgado. 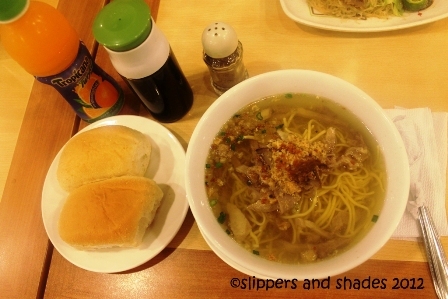 Special Batchoy costs P75 to which I combined two big pandesal (P8/piece). The bowl was full of tasty soup and yummy noodles. At last I’ve tasted the original Batchoy which I vowed to eat when I visit Iloilo. And my craving was now satisfied. Namit gid! Other resto near SM Delgado were Shakey’s, Sbarro and Deco’s (to which Batchoy was so delicious too according to my hubby). 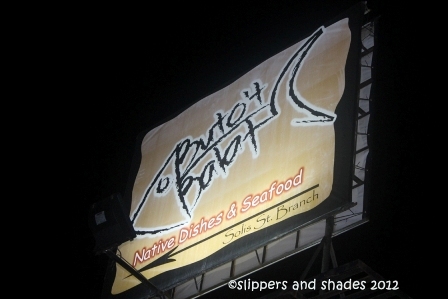 Buto’t Balat Native Dishes & Seafood, Griller’s Oyster House are found on Solis Street. My hubby was so lucky that he tasted all Iloilo’s delicacies in twelve days. He promised to cook binakol (version of chicken tinola) if he goes back home. Binakol is a chicken dish to which its soup is based on sweet water of coconut. Sorry for me that I miss the opportunity to eat it all for I only have three days in the city. I need to go back to taste it all.hehehe. 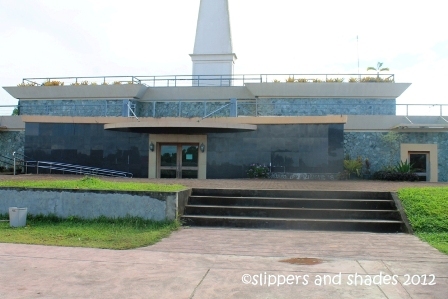 There were three SM malls all over Iloilo. I chanced to visit SM Delgado and SM City Iloilo. There were other malls in the city like Gaisano Mall, Robinsons Place, Amigo Mall (in Amigo Hotel) and Atrium Mall. 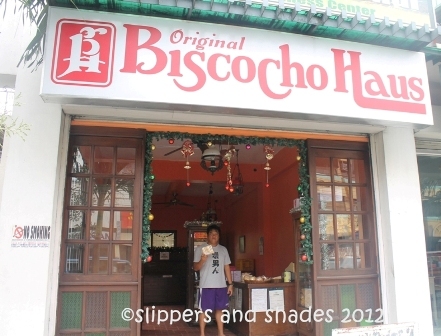 After a heavy breakfast the following morning, we headed to Bischoho Haus in Solis Street to buy pasalubong. It has a large variety of Ilonggo sweets to which biscocho, a yummy toasted bread with milk and sugar is their specialty. Other delicacies are piaya (mango or ube flavor), butterscotch, galletas, polvoron, otap, barquillos, macaroons, putomanapia, calamares and more. They have boxes with different sizes to store assorted items which can be hand-carried on plane. Prices depend on its size. It opens at 8 am and closes at 6 pm. After buying the food stuff, we boarded a jeepney (P7 fare) going to Central Market to buy souvenir items which is in a cheaper price compared to the mall. We explored the market with various selections of dried and wet goods like fish, fruits, vegetables and meat. There were several stores selling souvenir items and handicraft products. We bought key-chain (P35), t-shirts (P200 to P300), magnetic fish (P50) and cellphone accessories (P10). We didn’t find a bag with Iloilo tag so we headed to Gaisano Mall. But unfortunately, there was no such bag to that store too. In getting back to Amigo Hotel we rode a jeepney (P7) again with signboard Obrero. One thing I love here in Iloilo was the accessibility of transportation. Indeed the city could easily be navigated through foot. And there’s nothing to worry asking locals on directions for they were so kind to say the right way. But I was warned to be extra careful if we are on the main city for there were incidents on “snatching” of cell phone. 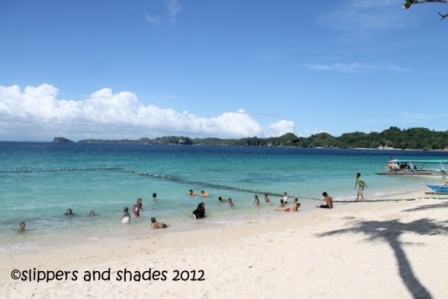 I was wrong when I said that there’s nothing much to enjoy in Iloilo for there was no known white beach to swim. But I found out, three days are not enough to explore this city. 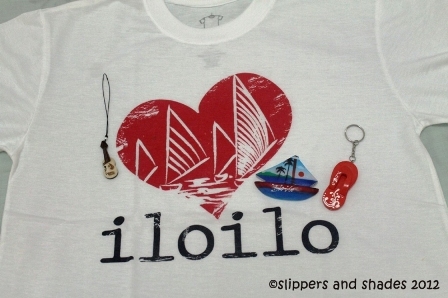 Thank you so much Flor for changing my idea about Iloilo. I had a wonderful experience and is willing to go back for another adventure. I want to eat the yummy native chicken at Tatoy’s restaurant again. I want to experience the gimmick flick in Smallville. I want to taste all Iloilo’s famous foods. 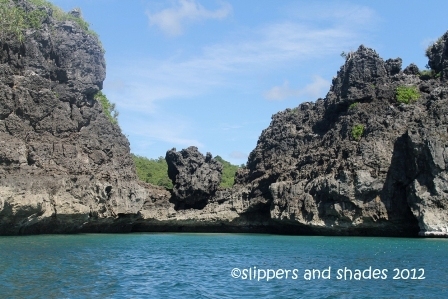 Guimaras was once a sub-province of Iloilo City until it became an independent province on May 22, 1992. 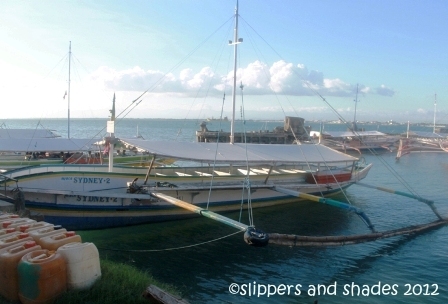 The primary gateway to the island province is through Parola and Ortiz Wharfs in Iloilo in a short and inexpensive boat ride. I was so happy that my hubby was on break this Saturday from his provincial project in Iloilo. 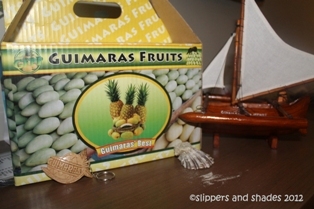 He had visited Guimaras last week with his colleagues, Jay and Bim, but he was still excited to go back there with me. I was so thankful to Flor, (my former office mate who is now based in Iloilo as a lawyer) for accompanying me yesterday on one-day Iloilo tour. Still relentlessly alive, she volunteered to go with us today in Guimaras. By seven a.m., Flor, with her best-friend Vic and Mat-mat fetched us in front of Amigo Hotel. We headed to Ortiz Wharf and bought ticket for P14/head. So affordable! We wrote our names on a logbook then we headed to our designated boat Sentosa. As soon as all seats were occupied, the boat moved in a sweeping motion. There was no overcrowding and there was a safety provision inside the boat. I was simply amazed of the organized set-up here. Upon arriving at Jordan Wharf (pronounced as Hordan), locals approached us and offered a tour ride. Tricycle and “multi-cab” (a small jeepney vehicle) are means of transportation in the area. We chose the latter for a rate of P1,500. 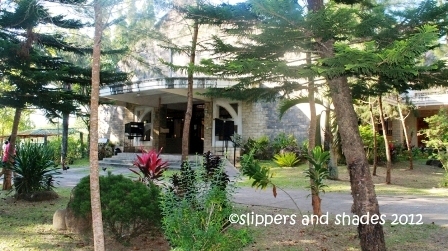 Our first stop was in Guimaras Museum in Jordan, but since it was Saturday, it was closed for visitors. After picture-taking in front of the museum, we headed to Cabaling Beach Resort located in Sitio Cabaling, still part of Jordan. 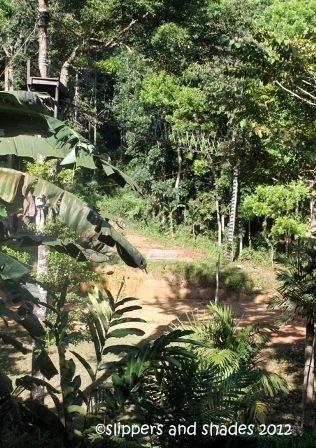 A friend of Flor referred the resort to us. She was excited to go there for it was her first time too. The road was rough and there very few houses that we passed by. It was a remote but scenic route. Flor’s stories and the bumpy ride kept us so alive. I got so excited seeing the sparkling blue water. We hastily hopped out from the van and went into the shoreline. The sand was ivory-white and the water was so clear. We passed by a little fishing area with lots of boats docked near the shore. We bought two kilos of fresh crab from a fisherman for P250 and he graciously offered to cook his fresh catch for P20 only. We were all awe stricken when we saw the resort. The water was clear and there was a short concrete bridge dramatically located in the middle of the little cove. It was so good to sit on the sand savoring the solitude and the tranquility that every nature lover would dream of. See the picture? Entrance fee – P25/head. 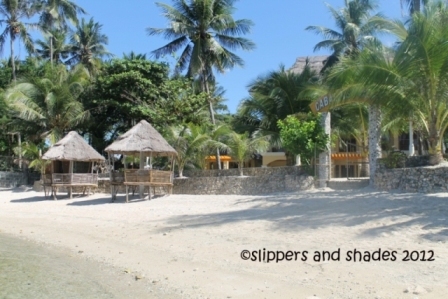 We were not asked anymore to pay for the wooden cottage (P500) on the beachfront for we will only stay for two hours. In return, we ordered grilled milk fish, rice and coke. We basked under the sun for less than one hour then we settled for lunch. 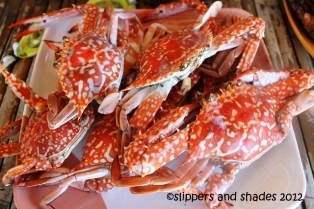 The crabs were so yummy and so the milk fish. It was a noisy lunch talking and laughing. Later, we were drawn into silence as we gazed into nature’s wonderful creation. The water was sparkling and the wind was gently blowing into our faces. Such a beautiful day! I was allowed by Elena, the caretaker of the resort to see the room on the ground floor. 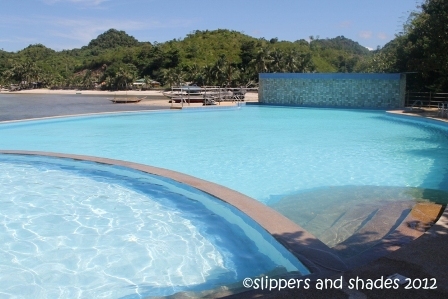 One night stay costs P3,500, good for two persons. Additional person is P150. It was so comfortable to spend the night in the room for it has nice bed, sofa corner, comfort room and window overlooking the beach. There was an infinity pool uphill. But we didn’t swim for we skip paying another entrance fee of P100/head. We just walked around and watched the beautiful sea view. Manong our driver referred a fisherman who was in the vicinity to bring us to Alubihod in our island hopping for P700 only. It favored us since the route will be shortened on water trip and we saved P800 from the regular rate of P1,500. Little did we know, the boat is not the regular pump boat used in island hopping but a small fishing boat with no life jacket, hence the price. I was a bit reluctant when we boarded. But the good weather whisked off that fear. It’s good to see various rock formations along the way. It was flickering hot but the wind was so calm and so the blue water. Later I saw smoke coming from below the boat. The boatman hurriedly turned off the engine and fixed the problem while his assistant pumped out the water. The water was still but the boat was turning slowly to the right because of the wind. Alubihod could now be seen from the distance. I prayed silently for our safety. Later, the engine roared up. Thank God. We didn’t hop to the cave anymore thinking of another boat malfunction. We headed straight to Raymen Beach Resort. My hubby was here last week. He didn’t enjoy much because of rocks on the sea floor. This time he discovered that there was an area where sand was so fine and free from disturbing rocks. But it was beyond the rope which serves as the safe boundary. The resort with its creamy white sand was stunning, really. We didn’t pay for the entrance fee because we didn’t swim. 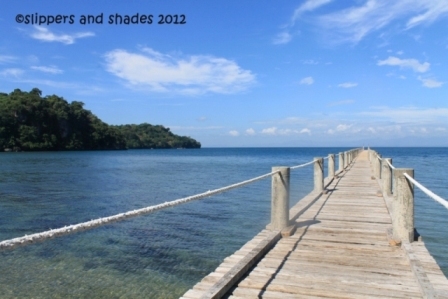 We did picture-taking and some lazy walk along the shoreline albeit the blistering heat of the sun. 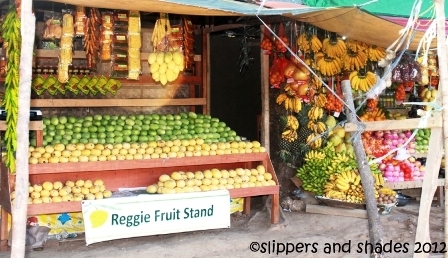 We bought mango shake (P45) then headed to the souvenir store and bought items like key-chains (P30), magnetic fish (P100) and t-shirts (P200 to P300). 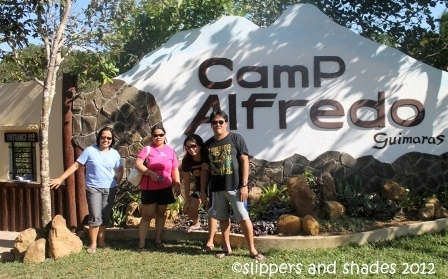 Our next stop is in Camp Alfredo along the highway in Brgy. Ravina, Sibunag. Entrance fee is P30/head. Exciting activity is the canopy tour, making the primary use of zipline, then crossing a thin hanging bridge and will go down through rappelling (P425). I was used to riding a zipline, but the height of the hanging bridge made my spine shivered. No one from us brave this fear factor activity. hahaha! 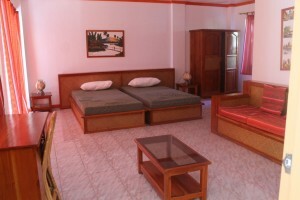 Rooms cost P3,500, good for four persons, but only two had free breakfast. There was a small pool, restaurant and bar, camping grounds, cabin rooms, stations of the cross, prayer area located uphill and air soft ground. Our next stop is in Trappist Monastery to buy sweet mango products. We tasted Mango Bar which costs P95. It was yummy. We met the gentle monk, Brother Peter outside the prayer house. We passed by lots of mango trees which was scattered beside the road. 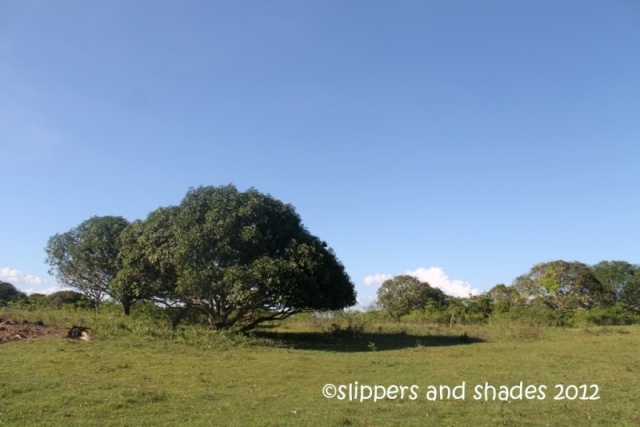 It was so wonderful seeing this verdant landscape though there were no fruits hanging on each trees because it was off-season. 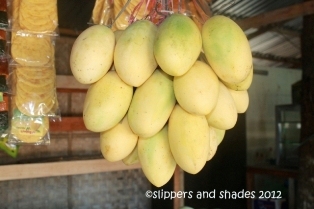 We bought fresh mango (P70 per kilo) and mango sweets in a fruit stand in Buenavista. We were given half slice for free taste. It was so sweet. 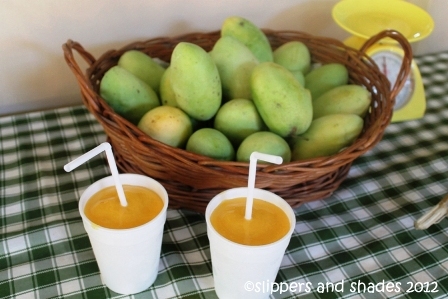 The local government prohibits bringing mango into the island as this will cross-breed their sweet mangoes. We went back to the wharf around 4 pm through the boat Sydney. Exhausted, but I felt so elated. As I looked back to the Island of Guimaras, I was overjoyed for I had again another wonderful adventure with nature, nice beach, friends, and with my husband. Ask if I will go back? Surely, I will.